Who doesn’t love a good laugh? At the Melbourne International Comedy Festival, you’ll find plenty of opportunities to crack a smile. This is a big one, even by international standards! It is the world’s third-largest comedy festival and has been running for some thirty-two years. Pretty impressive, hey! It takes place over four weeks from March through to April and generally features a nice mix of internationally acclaimed, experienced comedians, “the next big thing,” and newbies who are trying their hand at the big league for the first time. Needless to say, virtually any show will delight. Not entirely sure who you want to see? Make your way to the booths just outside City Hall. The individuals who work in this booth will be able to recommend the perfect shows for you! Every year I've been I have been given wonderful recommendations for shows and was introduced to incredible comedians I would not have typically seen. Fireworks in any form are always entertaining. But when it’s the Brisbane Riverfire? Well, that’s something else entirely. This show is arguably the largest fireworks display in Australia, and it’s all set to music. Because the fireworks are launched from various locations, it really does seem like the whole sky is lit up. For the best experience, take a look at a Riverfire boat hire. It’ll allow you to experience the fireworks in the most awesome way possible: from the water. Love blues music? Then you won’t want to miss the Byron Bay Bluesfest. Its been running for some thirty years and has featured some of the world’s biggest musical. Taking place over four days in April, the festival doesn’t just excite the locals and the thousands of travellers who make a special trip to attend; it’s also popular with celebrities, who are always at the festival in force. This year’s highlights include such musical acts as Iggy Pop, Ben Harper, David Gray, Hozier, and about a billion other incredible artists. It’s more than a blues festival: there’s something for all music lovers. And now for something completely different. Parrtjima is a unique festival that is focused on Aboriginal culture and its artwork. All the installations are created by Indigenous artists. Spread over ten days, the festival is free, and gives visitors the opportunity to experience the beautiful outdoors in an entirely new way. If you're new to Australia or have lived here for years, it is a great way to learn more about Australia's First People. Finally, don’t forget Sydney’s Mardis Gras, an inclusive LGBT festival that’s big on life, art, and all-around good times. It’s well worth taking a trip to Sydney just to soak up the atmosphere, but if you want to do things a little bit more formally, you’ll find that there’s plenty of events and shows that you can attend too. 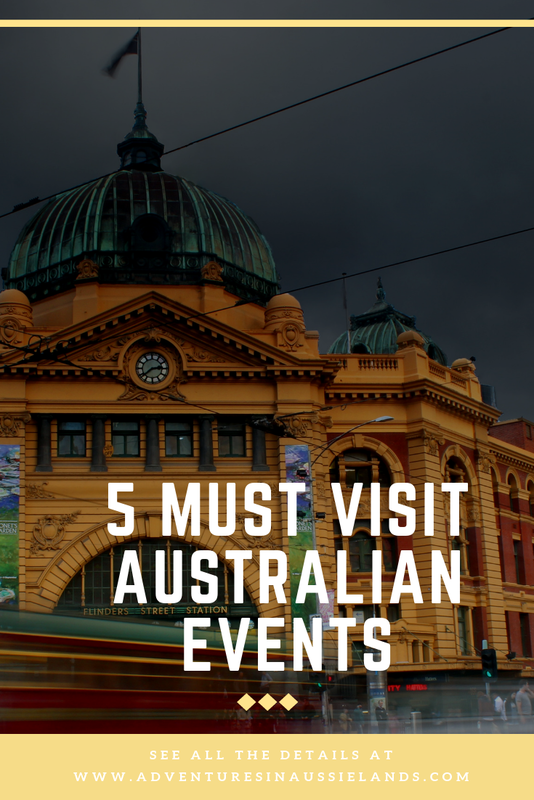 If any of the above are missing from your “Australian bucket list,” make sure you add these spectacular events to it this year! I would love to visit Australia at some point. The Brisbane riverfire sounds like an event I would like to see. I had no idea they celebrated Mardi Gras in Australia. I bet it is an amazing celebration. May have to book a flight soon. It is honestly so much fun! A definite must if you're in Australia when its on. All of these events sound really cool! I love fireworks so I would love the Brisbane Riverfire. I have never been to Australia, but I hope to go one day. Wait Sydney has Mardi Gras?? Wow didnt know that and would be cool to attend. Yes it does! It's one of the biggest Mardi Gras celebrations as well! Not only is it massive but its also super inclusive. I want to visit Australia one day. These events all look really exciting! My bucket list is getting really long! That's interesting that Mardi Gras is an LGBT themed festival out there. IT's not that we don't have Mardi Gras or that there aren't LGBT people celebrating it. It's just not the major reason for the event. The aboriginal festival does sound amazing I have to admit. It honestly is one of the best events here in Australia. It's super inclusive and everyone has a wonderful time! Australia has been on my wish list for years. I love to go there on all these events. Thanks for the information. Oh I sure am interested with the Mar di Gras. Such festivals are so much fun. The street dancing is awesome and colorful! I will put it on the list for my next visit.